A fundraiser to benefit the Diasporic Vietnamese Arts Network. 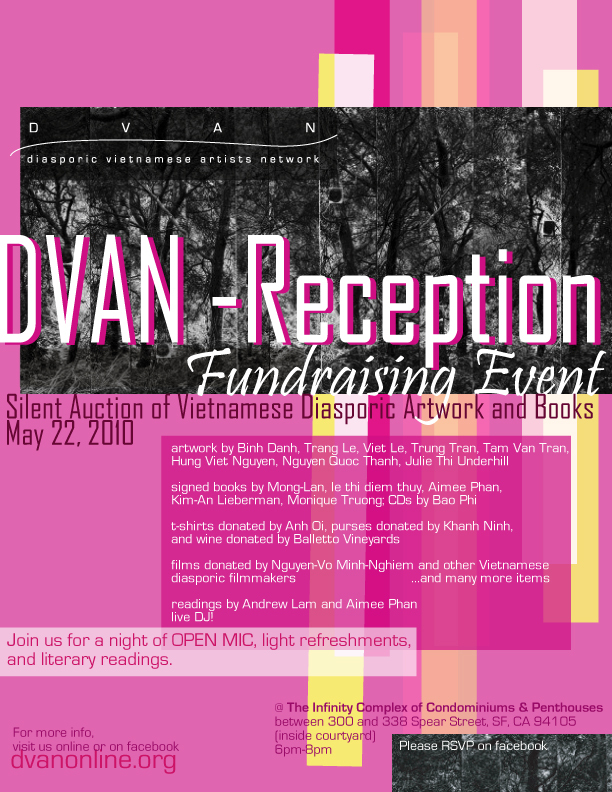 There will be a silent auction of artwork by Binh Danh,Hung Viet Nguyen, Trang Le,Viet Le, Trung Tran, Tam Van Tran, Julie Thi Underhill, Nguyen Quoc Thanh, and Emily Payne, signed books by le thi diem thuy, Kim-An Lieberman, Aimee Phan, Monique Truong, Truong Tran and Mong-Lan, CDs by Bao Phi, films donated by Timothy Linh Bui, Charlie Nguyen, Nguyen-Vo Minh-Nghiem, Ham Tran, and others, dinner for two at Slanted Door and a two-night stay at a designer house in Tam Dao, featured in many magazines. There will also be readings by Andrew Lam and Aimee Phan, followed by an OPEN MIC. Bring your work to read, sing, or perform! DJ Kevin provides the music. Appetizers donated by Sugar Bowl Bakery, Hodo Soy Beanery, Chilipepper Event (Asian Chef Association), Ana Mandara Restaurant, and many more items. You can RSVP at the facebook invitation page.